When people hear that you are a huge fan of movies, usually the next question to come from their lips is “What's your favourite movie?”, and for a very long time my answer has always been William Friedkin's “The Exorcist”. However, I started doubting the validity of this recently as, while I consider that film a bonafide 5-star classic, it is a film that I very rarely watch. Maybe it is the intensity of the film, I'm not sure, but as brilliant as “The Exorcist” is, it is not often that I pop it in the blu-ray player to revisit. The film that I have watched more than any other, and one that I never tire of watching though is John Carpenter's 1978 masterpiece, the original “Halloween”. So now whenever that inevitable question is posed, “Halloween” is my go to response, and honestly I feel much more comfortable with that answer. Anyway, I guess that is a very long winded way of saying that whenever a new “Halloween” film is released, it has a lot to live up to for me. Especially true with this latest entry, as it is a direct sequel from the original film, existing in its own universe where all the other sequels did not happen. Forty years after the night Michael Myers butchered three of Laurie Strode's closest friends, we are witness to how these events have affected the rest of their lives. Michael, after being captured and incarcerated once again at Smith's Grove Sanitarium, has remained dormant and silent, not uttering a single word. Laurie on the other hand lives her life in constant fear. The events that took place on Halloween night on 1978 have defined her and she has never been able to get past them. She has suffered two failed marriages, and had her only daughter Karen removed from her care (when she was aged twelve), when it was deemed that her survivalist upbringing bordered on child abuse. You see, Laurie refuses to ever be a victim again, and has prepared her entire life to be ready if and when Michael Myers escapes once more. This time she wants to be the hunter, and Michael the hunted. And as luck would have it, she will get her chance, as the bus that was relocating a number of the sanitarium's patients (including Michael) has just crashed, and Michael has escaped and he is heading straight to Haddonfield to once again wreck havoc on whoever gets in his way. 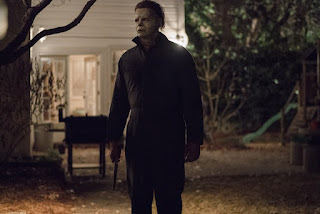 The timeline of the “Halloween” franchise is one of the most convoluted in horror history, and this is actually the second time where a sequel has essentially forgotten all that had come before it and continued on from the initial night of carnage. Where this new film differs from “Halloween H20” though, is that the 1998 film continued on from “Halloween II” where as now only the original “Halloween” is considered canon. The single greatest mistake in the franchise, in my opinion, was the decision to make Michael and Laurie siblings. It made no sense and confuses what makes Michael Myers so great and chilling; that he is pure evil and attacks with no purpose or agenda. Finally with this new film they have rectified this with Michael and Laurie being no longer related, however that said, it doesn't completely clean up the issue of Michael predominately stalking Laurie and her family. 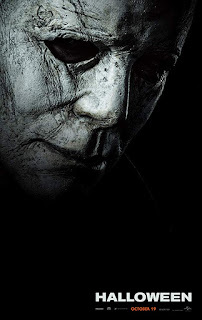 What is interesting between “Halloween (2018)” and “Halloween H20” is the way they tackle Laurie's trauma after surviving Michael's attack. In “H20” she is a terrified shell of a woman; a functioning alcoholic who has changed her name in an attempt to move on. The incarnation of Laurie that is seen in “Halloween (2018)” is equally as messed up but instead has been preparing herself and her family to never be in that same situation again. They will be ready for whatever comes their way in the form of weapons and gun training, and turning their house into survivalist's dream home. However this constant focus on “evil” has caused the relationships within Laurie's family to be strained to say the least. Personally, I found this latest chapter in the “Halloween” saga to be ultimately quite frustrating. There is so much good to be found in the film, but there is also some elements that just do not work or come together well. Firstly, let me focus on the good. Director David Gordon Green has done an outstanding job with the look of Michael Myers with his attention to detail second to none. Michael's mask looks spot on, with its aged look giving an extra level of creepiness to it. What impressed me most though are the little details, especially the small hole in the neck of the mask where Laurie stabbed him with the knitting needle in the original film. Not only that, although it is never focused on, Michael is now also blind in his left eye from the abuse he suffered in the closet from Laurie as she tried to do anything to survive. It is this care with all the details that shows just how much Green respects this character and the original film. The way Michael moves is also very impressive and believable as the same man, only forty years older, as that from the original. The highlight of the film is a truly fantastic sequence, done in one single shot, of Michael walking down a street of Haddonfield and entering the homes and killing it's residents. It is a chilling sequence, in its brutality that also signifies in big bold letters: MICKEY IS BACK!! There is also another brilliant moment where he dispatches a babysitter (who also happens to be the best friend of Laurie's grand-daughter) that feels so reminiscent of the original. Green also brings back the playful and stalking side of Michael Myers, as we get a reprise of the “ghost sheet” although in a different way entirely, as well as the fact that he hides his victims in places to mess with his future victims. On the other side of the coin, I also really loved seeing Laurie once more (played again by Jamie Lee Curtis with extreme gusto), and thought the additions to her family were great inclusions. Judy Greer plays Karen, Laurie's estranged daughter and is totally fantastic in the role. You can feel the love for her mother, while also being weary of her in the fact that she does not want her life to be bogged down by her mother's baggage any longer. While Judy Greer gets “the” moment in the film, I really loved Andi Matichak in the role of Allyson, Laurie's grand-daughter. She actually has that sweet innocence that Laurie brought in the original film, and I hope that the future of the franchise will end up focusing more on her. Now where the film is frustrating is that there is far too much going on in it. The brilliance of John Carpenter's original film is all in its simplicity, and I feel that “Halloween (2018)” needed to be streamlined to have worked at its full. The main problem with the film is that the story is kind of dumb, with a number of uninteresting characters. Unfortunately the majority of the men in the story turn out to be pointless, with a focus on Allyson's boyfriend turning out to be a major time waster and nothing more. Arguably the most interesting character in the film is Dr. Sartain, Michael's current doctor, and someone who Laurie erroneously describes as the “new Loomis”. What makes him potentially so interesting is the fact that this is a man who has studied Michael Myers for forty years and never once got to hear him utter a single word in that time. He has only studied him in controlled circumstances and now he finally gets to see his obsession in full flight, doing what he is famous for. It is an exciting moment for him, as he finally gets the chance to understand what drives him, only to discover that there is nothing to understand: Michael is pure evil. This is all good stuff, but the character of Dr. Sartain and his story is really badly handled making vital plot points unnecessarily confusing. If they cleaned this section up, the film would be so much greater. The other part of the film that I am not totally thrilled with is the podcast opening. While it seems like a ploy to appeal to today's audiences, the whole thing ends up feeling more like an extended excuse for Michael to retrieve his mask. A highlight of this new “Halloween” film was getting John Carpenter back in some sort of creative capacity. While he did not direct the film, he did contribute to the film's score along with his son Cody Carpenter and Daniel A. Davies. I must admit that the first time that I saw the film, I was quite disappointed by the score. I have realised though that this is more due to what I expected the score to sound like rather than the quality of the score itself. I was expecting or hoping it to focus on the music from the original, rather than use that sparingly and use it as more of an inspiration like the score does. While I still do not love the new score, my second screening of the film I was able to appreciate it more for what it was, rather than what I wanted it to be. Overall, despite a lot of great elements within it, this new “Halloween” was a frustrating experience. I was a huge fan of the attention to detail shown, and pretty much everything to do with Michael Myers himself in the film. He looked and moved great, and when he was stalking and slashing, the movie just worked. It felt like a “Halloween” film and one that co-existed in the world of the original. However, the film was bogged down with too many characters and subplots that took away from the main story more than it added to it. I felt that the film was messy, and at times the editing was choppy and if the film was streamlined more to focus solely on the Strode vs Myers storyline, it would've ended in a better film. That said, the confrontation between them all was quite satisfying although I preferred the ultimate ending of “Halloween H20” more than this one. Still, I do like the film quite a bit, and I hope that it continues with the younger members of the Strode family (leave poor Laurie alone now). I really want to love this film more than I do, but it is still a good “Halloween” movie that I have no problem recommending to fans of the franchise.